The AWS certification training is designed to help you gain an in-depth understanding of Amazon Web Services (AWS) architectural principles and services such as IAM, VPC, EC2, EBS and more. The course is aligned with the latest exam announced by AWS, and you will learn how to design and scale AWS Cloud implementations with best practices recommended by Amazon. AWS certified solutions architects command average salaries of $129,000 per year, so get started in this exciting field today. AWS certification will verify your technical understanding and skills in the AWS domain and is highly desired by recruiters. 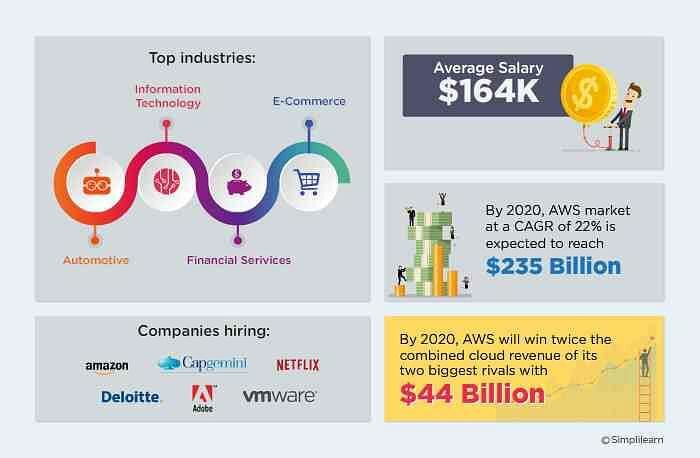 AWS Certified Solutions Architect Associate is consistently ranked as one of the top certification programs and the AWS market is expected to reach $236B by 2020 at a CAGR of 22 per cent. According to Indeed.com average annual salary of AWS Solutions Architect is $129,000. There are more than 380,000 cloud computing jobs available around the world, and the need for certified cloud computing professionals is increasing every year. This AWS training course will make you exam-ready for the AWS Solutions Architect Associate certification and will enable you to leverage your skills and expertise involving advanced cloud-based solutions, and migrating existing workloads to the cloud. Who should take this online AWS solutions architect course? What types of jobs require AWS Solutions Architect certified professionals? AWS Solutions Architect Certified Professionals are required for solving operational issues in an organization and are also responsible for implementing new software for complex deployment, infrastructure, design and troubleshooting of cloud solutions. Cloud Developer, Cloud Software Engineer, AWS Solutions Architect and DevOps Engineer are examples of jobs that require AWS certification. What are the prerequisites for the AWS certification? Prior experience in working with AWS services is recommended. How do I become an AWS certified Solutions Architect Associate? What are the benefits of taking up this AWS Solutions Architect certification? In addition to the enhanced AWS cloud skillsets you will develop, you will gain access to the AWS Certified Global Community LinkedIn Group and receive an AWS Certification Practice Exam Voucher. How much does AWS Solutions Architect Certification exam cost? The cost for the Cloud Practitioner exam is $100. The cost for Associate-level exam is $150. The cost for the Professional-level and Specialty exam is $300. The recertification exam is $75 (taxes may apply). What is the recommended process to prepare for the AWS Solutions Architect Certification? Step 1: Complete the AWS training to enhance your technical skills with AWS. Step 2: Review the AWS Certified Cloud Practitioner Exam Guide and sample questions to assess your knowledge. Step 3: Review AWS whitepapers written by our AWS team, AWS partners, and AWS analysts to broaden your knowledge and understanding. Step 4: Take a practice test on our online platform. Step 5: Schedule and pass your AWS Certification Exam at an exam centre of your choice to become certified. How do I pass the AWS Solutions Architect Certification Exam? To pass the AWS Solutions Architect, you must answer 65 multiple-choice questions in 130 minutes. Passing scores for the AWS certification are set by different variables and are subject to change from time to time, which is why AWS does not declare passing marks in advance. When is the next AWS Solutions Architect Certification exam? The latest AWS solutions architect certification exam is valid from August 12, 2018. If I fail the AWS Solutions Architect Certification Exam, how soon can I retake it? If you fail the AWS Solutions Architect Certification Exam, you must wait 14 days to retake the exam. There are no limits on the number of times you can take the exam. Only one attempt is applicable for Beta exam takers. How do I schedule the exam in my preferred location? To see a complete list of test centres in your area with preferable dates, sign in to aws.training and click "Certification." Then click on “AWS Certification Account,” followed by “Schedule and Manage Exams.” Fill in your city or ZIP code to view a list of all available test centres in your location. How long does it take to receive the AWS Solutions Architect Certification exam results? How long is the AWS Solutions Architect Certification valid for? You will be required to apply for recertification every two years to maintain the validity of all of your AWS certifications. They will send you an email six months before your certification validity is about to end. How do I apply for AWS Solutions Architect Certification reexamination? To apply for reexamination, sign in to aws.training and click “Certification,” then click on “AWS Certification Account,” followed by “Schedule New Exam." Yes, we provide 1 practice test as part of our course to help you prepare for the actual certification exam. 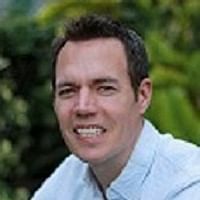 You can try this free AWS Solution Architect practice test to understand the type of tests that are part of the course curriculum. Detailed Learning Course. Excellent! It's very helpful & informative. The trainer is extremely good, he is very knowledgeable and one of the best teachers @simplilearn. Thank you again. I had enrolled for AWS Solution Architect course from Simplilearn. The best part of the course was that it was a mix of online videos and Webex classroom session. This helps the professionals like me who are always traveling. I gained the required knowledge without sacrificing my working hours or personal time.I really enjoyed the course and would like to sign up for the next one. My trainer was really very patient and made sure to address all our doubts. The journey with Simplilearn has indeed been a great experience because of the way the trainers explained the topics. I recently took the AWS Solution Architect Associate course from Simplilearn. I am very impressed with the quality of the course content and its structure. I am very keen to recommend Simplilearn for developing my IT skills. This course is great for both teams and managers. I had enrolled for AWS Solution Architect course from Simplilearn. It was an online live classroom course. Simplilearn has great trainers with good experience in teaching as well as on AWS domain. Training material prepared by Simplilearn was also excellent. I have attended AWS Solution Architect program from Simplilearn. The concepts were well explained and the lab sessions were useful. All questions were answered satisfactorily. I would strongly recommend this program to anyone who wishes to get to the depths of AWS. Thanks. The trainer was fantastic. She was very supportive and was always there to clear the doubts by giving practical and theoretical examples. She was perfect. Overall, it was a great a great experience. 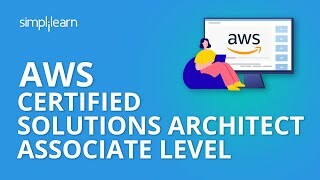 Simplilearn's AWS Solution Architect Associate certification was excellent. The trainer covered all the topics and had a great knowledge of AWS. Trainers are really very good, customer support and teaching staff support is excellent. I have completed AWS technical essentials and AWS Solution architect training from Simplilearn and planning for some other courses as well. Go for it. Thank you team and Good Luck! I had registered for AWS Associate Solution Architect certification from Simplilearn. The course content is very extensive with a lot of real-time examples which provide a good understanding of the course. The LMS and customer support are excellent. If anyone is planning for AWS certifications, I strongly recommend Simplilearn. The training content was good & it was presented well. Looking forward to learn more about AWS. All of our highly qualified trainers are industry experts with at least 10-12 years of relevant teaching experience. Each of them has gone through a rigorous selection process which includes profile screening, technical evaluation, and a training demo before they are certified to train for us. We also ensure that only those trainers with a high alumni rating continue to train for us. Is this live AWS training, or will I watch prerecorded videos? This AWS training is conducted via live streaming. They are interactive sessions that enable you to ask questions and participate in discussions during class time. We do, however, provide recordings of each session you attend for your future reference. Classes are attended by a global audience to enrich your learning experience. What certification will I receive after completing the AWS training? Upon successful completion of the AWS Solution Architect Certification training, you will be awarded industry recognized course completion certificate from Simplilearn. Is the AWS exam fee included in the course fee? No. The AWS exam fee is not included in the course fee. What is the "AWS Accredited Body" Exam Fee Refund Policy? There is no fee to cancel or reschedule your exam if you do so more than 48 hours prior to the exam. If you need to cancel or reschedule within 48 hours, you will need to pay a $60 fee. You are not allowed to reschedule or abort an exam within 24 hours of exam duration. If you fail to appear for your scheduled exam, your AWS exam fee will be forfeited and will not be refunded. You will not be allowed to reregister for the exam for the next 24 hours from the time of the missed exam. However, missing the AWS exam does not mean that you have ‘failed’ the exam. How do I register for the AWS Solutions Architect Certification exam session on Simplilearn?